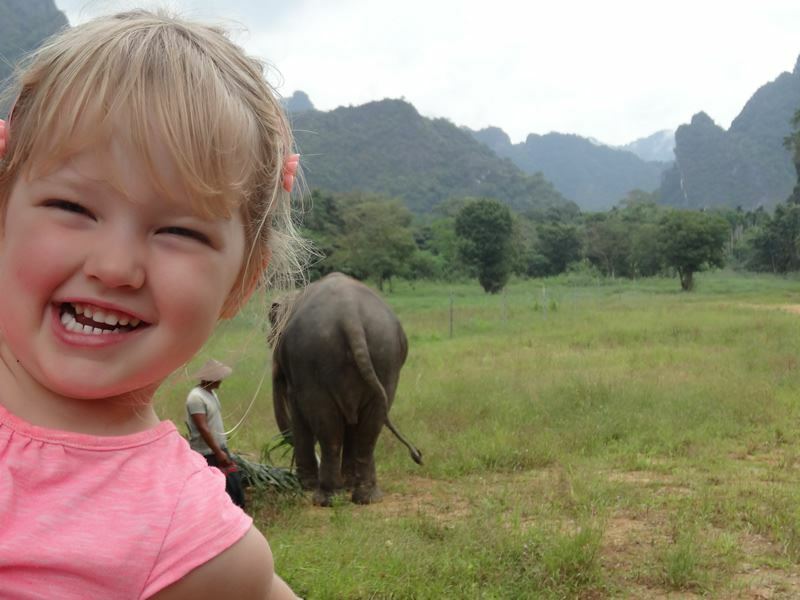 Recently our Product and Marketing Director Mags went on an unforgettable family trip to Thailand. 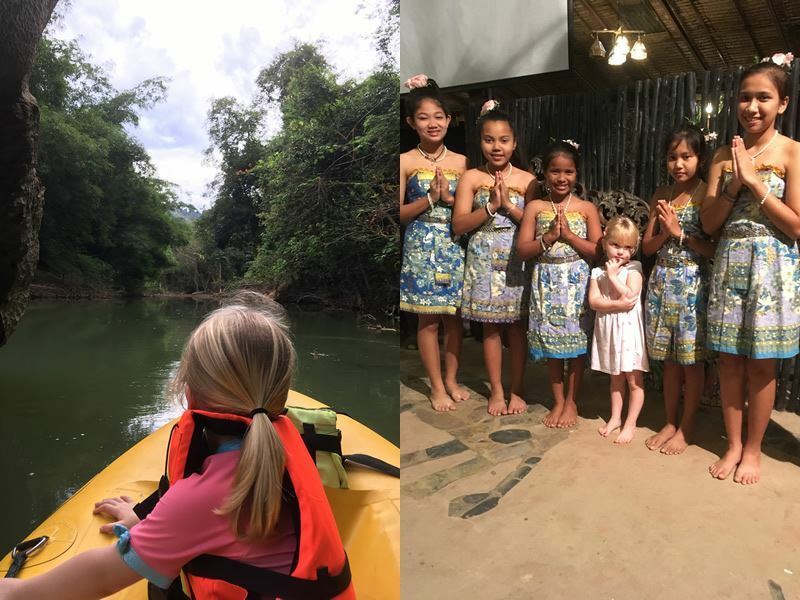 With her three year old daughter and husband in tow, Mags had an amazing time exploring Bangkok with her friends, soaking up the sun in Khao Lak, and spending the most phenomenal two nights in Elephant Hills. 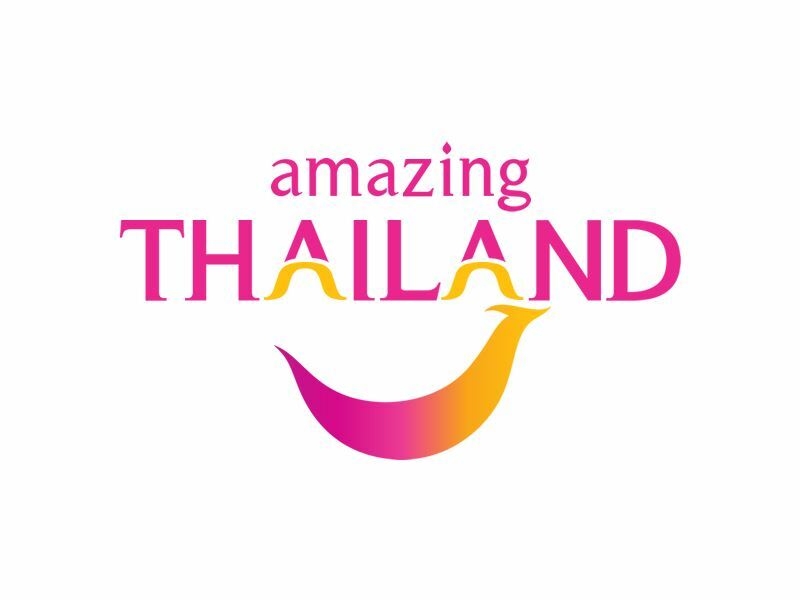 We're all very jealous of this amazing trip, and we think it will certainly inspire you to book a trip to Thailand as soon as possible. I'm fortunate enough with my travel plans that my holiday experiences rarely disappoint, and whilst I always have massive preconceptions, it's more often the case that the reality leaves a far greater impression than planned. This year’s holiday plans were probably the most exciting since becoming a parent, after all it's not often you can tell a 3 year old that it's only 6 sleeps until she'll be camping where the elephants live. To those who know me, it's no secret that Thailand is one of my favourite destinations - it's arguably the most beautiful country in the world, and full of beautiful people. 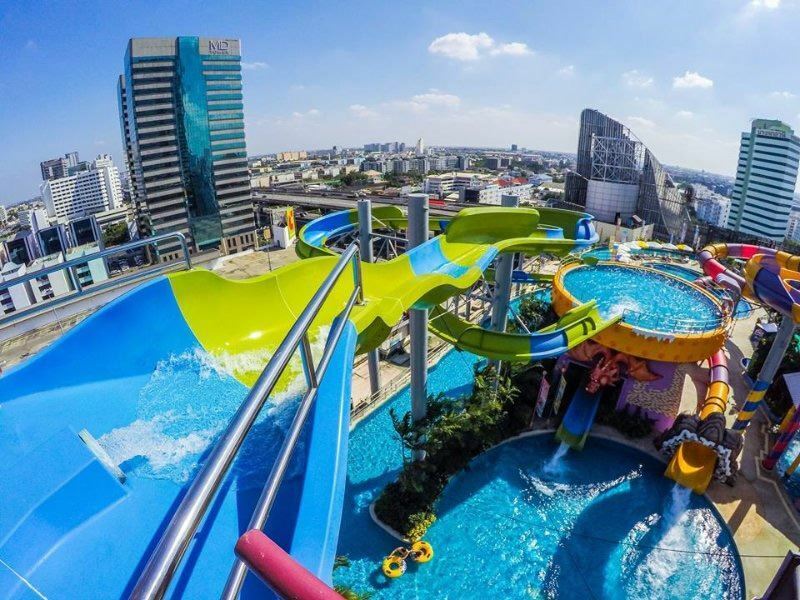 So when one of my closest friends decided to relocate to Bangkok for a few years it seemed the obvious place for our first 'experiential' family holiday. Now I say obvious - for a keen traveller like me it was a no-brainer - but we all need to plan around our travel companions and mine happens to be one of the 40% of travellers with a fear of flying. Coupled with an independent minded (aka stubborn) three year old, long haul flights and holidays take a bit of courage and careful thought, so that means taking the most direct route available with the least hassle, and with the fewest possible take off & landings. Therefore our airline of choice was EVA Air, an airline that is often overlooked yet provides an excellent flight experience, and is one of only three airlines offering direct flights into Bangkok. Whichever route you take, Bangkok is a long way from London, so we opted for their equivalent of Premium Economy - Elite Class, which didn't disappoint in any way. The seats had an impressive amount of legroom, far better than most other airlines I've flown with, and there was a pretty good range of in-flight entertainment. My daughter was happy, therefore I was happy. We flew the 11+ hours overnight in the hope we all got a bit of sleep. Again, my sleeping daughter was happy... but when the seat is comfy a few missed zzz's isn't the end of the world. If I was going to give any room for improvement with the flight I would say two things - one, the kid's pack wasn't as good as expected. This is surprising given the airline sponsors Hello Kitty, yet it had only a one page 3D sticker game on the way out, and a jigsaw on the way back rather than a fun goody bag you usually get on other airlines. Two, the food - whilst good quality - was perhaps not everyone's cup of tea. As the flag carrier of Taiwan you might expect a little spice and I thought the main meal was lovely, but when opting for the Western style vs Chinese style breakfast I wasn't expecting beef & potato pie. However, all in all it was an excellent flight with great service and I will most certainly fly with them again. And so that brings us to Bangkok. I'm not a fan of big cities but you can't knock 'Bangers' for being one of the best. I've been lucky enough to visit many times before, so whilst this was a very short two night stay I wasn't here to do the usual tourist things. 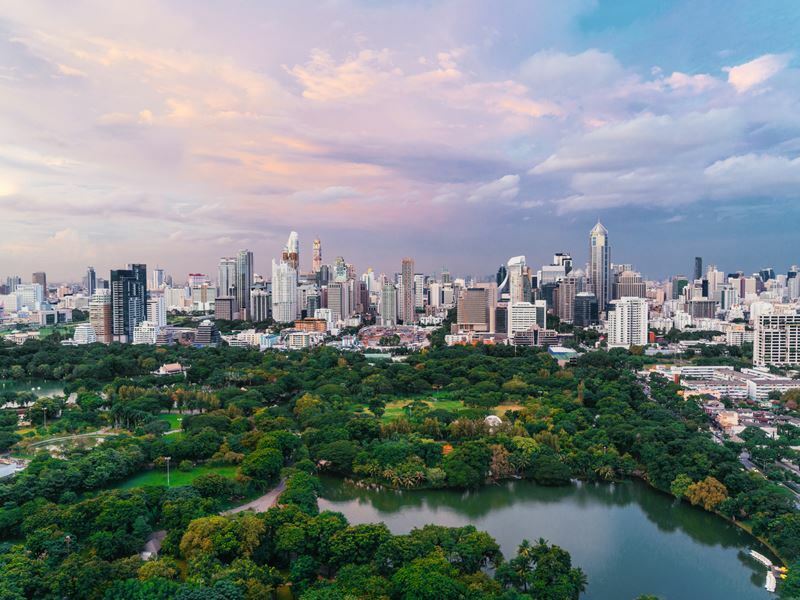 With all temples, palaces and tourist sites duly ticked off on past visits by my husband and I, I was keen to explore a more family friendly Bangkok. If I'd had a few more nights to spare we could have had the most amazing experiences, but this was about seeing good friends, getting used to the time zone and relaxing as a family - surprisingly easy in a crazy, fast paced city. With some time at Pororo Aquapark (a roof top water slide extravaganza that would probably be very busy on a hot weekend but was spookily quiet on a sunny school day morning), a bit of shopping and an evening stroll around Lumpini park, we had a fun yet relaxed 48 hours in the city. If you're into a bit of people watching or just like to get to grips with the local culture and way of life, Lumpini has to be up there with some of the world’s best city parks with activities going on in every direction - after work joggers fill the main paths, but turn a corner and you'll find a hundred or so people taking part in a huge aerobics class. Keep going and on the next corner you'll see a ballroom dancing lesson, the next an oasis of peace and calm with a shrine for quiet reflection and prayer. Mix that all with fabulous kids play areas, the usual ball sports and a morning of yoga & tai-chi and you have a very special haven of greenery in the middle of a very hectic city. The eateries didn't disappoint either. Staying local to our hosts, we dined just off Sukhumvit Road one night in a great place called Zak's, serving a perfect mix of international cuisine for that 'just off the plane' feeling. The next night we discovered Tummy Yummy - a tiny place serving fabulous Thai food in a gorgeous garden setting - very highly recommended. Too soon it was time to say farewell, but to the excitement of a three year-old, the beach was next. Khao Lak is a resort area I've been keen to visit on holiday for a while - I'd heard great things, so had high expectations of long sweeping sandy beaches, excellent accommodation, and most of all a slow paced, peaceful resort. I wasn't disappointed. Whilst there's no real resort area, there is a small town centre that would suit your basic needs with a few local restaurants and shops - but overall there is very little to see or do away from the beach. 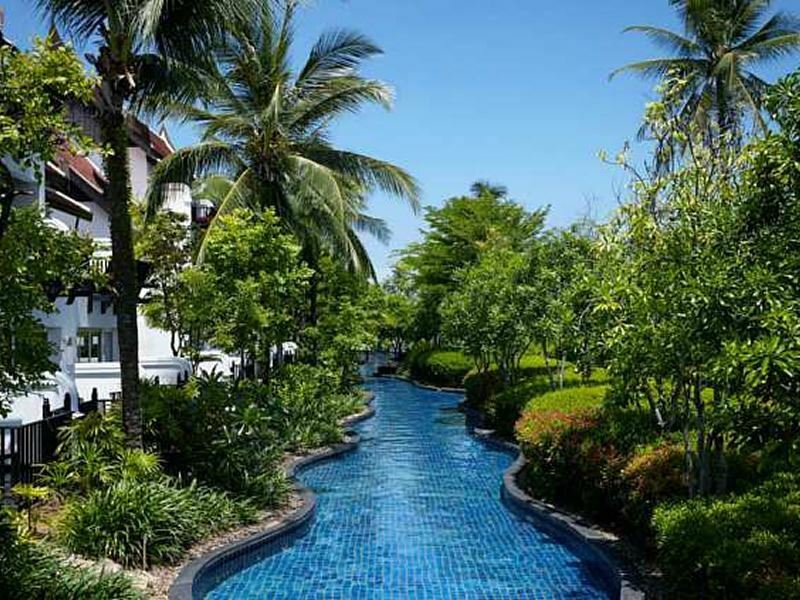 Despite this, it's perfectly located for trips into the National Park, and the resort area itself stretches along a beautiful 30km stretch of beach in the north of Phuket. 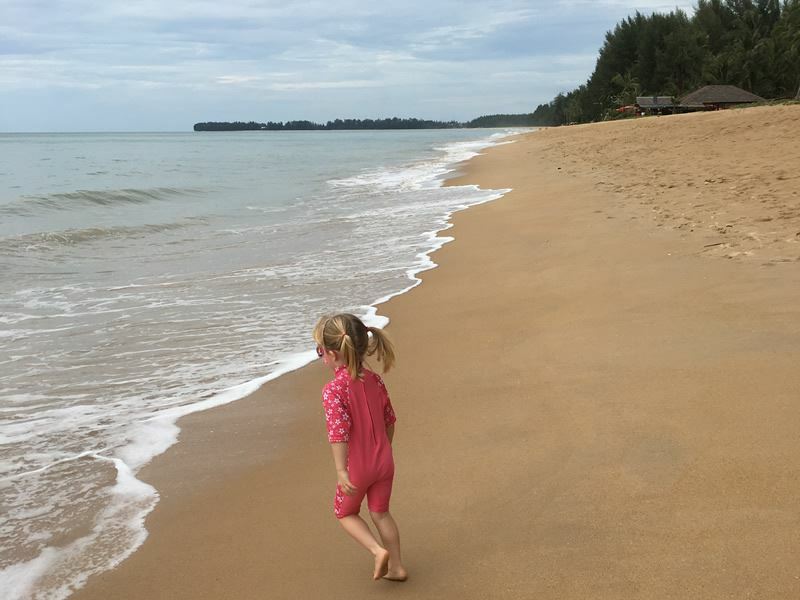 My hotel of choice was the 5* JW Marriott Khao Lak Resort & Spa, and as much as I like a touch of luxury, my key focus was the family facilities on offer. As expected from a brand of this calibre the rooms and overall facilities were top notch. The rooms were spacious and well laid out, all offering balconies or terraces, whilst the ground floor rooms offered direct pool access. I had decided against booking one of the ground floor pool access rooms as I was unsure of the safety levels for overkeen children, but it turns out the hotel has really thought it through, so I wish I had upgraded. The lagoon is a huge selling point for this resort, flowing around each of the four wings in a W shape, and the lagoon access rooms had a variety of barriers from room to water - the more adult-focused rooms had no barrier, whilst others had either wooden fences, stepping stone pathways, or modern child-safe glass. The hotel will only allocate those with barriers to younger families, though they do have a lower age limit. Nevertheless, the resort really ticked all the boxes. As the family rooms were laid out around the quieter lagoon areas and the kid's pool it was very quiet after dark and we had a very peaceful stay. The four restaurants are located along the front of the resort overlooking either the beach or main pool areas, with a large spa at the far end, and though it's probably hard to find a free sun lounger in high season, there were plenty of chill out zones around the pools and gardens to relax in. One of the beaches was reserved for those over the age of 12, great for those hoping to relax away from the younger kids, and some areas of the main restaurants could even be reserved as child-free. One of my favourite parts had to be the large stretch of secluded beach and lack of neighbouring hotels, meaning that were was plenty of space to sit and relax in the sun with a stunning view of the sea. If it wasn't for a couple of river inlets a few hundred metres either side you could probably walk for miles. Right next to the hotel's boundary there is a choice of three local restaurants right on the beach, and a vast choice of massage services. I chose to walk a little further along the beach to Ranry's where I enjoyed the most amazing one hour Thai massage for 300 baht (about £7.50), which can't be sniffed at. Their priciest treatment was a whole 500 baht - compare that to the hotel spa and you'd barely get a fruit tea for that price, though if you want air-conditioning and spa music over fresh air and crashing waves be my guest. After a couple of days here, we headed off to the jungle for the piece de resistance - Elephant Hills in Khao Sok National Park. It was everything I'd hoped for and more, though the weather did let us down on our second day. Getting to Elephant Hills requires an early start as activities start between 10.30 - 11am, and whilst you could choose to arrive later and miss a day that would be a real shame. Khao Lak is one of the nearest beach resorts, taking a maximum of two hours by road, so I wouldn't recommend going straight from the airport if you want to arrive fresh and be ready to participate fully. The resort itself was very well laid out. There was one central bar and an open-air dining area which hosts all briefings and entertainment, whilst the small pool located slightly below the dining area had amazing views of the river. The tents were then scattered amongst the trees a short walk away from this area, and though basic, they were very comfortable and spacious. The tents are simply canvas sided structures on a solid base with full bathrooms offering plenty of hot water and electricity, all constructed well to keep the smaller jungle friends out and you and your loved ones in. You will of course encounter a few four, six and eight legged locals as you walk through the camp but they didn’t seem keen on mingling, so follow the Buddhist philosophy of live and let live and you'll certainly enjoy spotting them. In terms of activities, the team at Elephant Hills had everything arranged perfectly. In typical Thai style your day is well planned and the itinerary is followed to the letter regardless of weather or any other such issue (more on that later). All guests are on a mix of one, two or three night tours, the shortest including a canoe safari and jungle trek, the longest adding a trip through the mangroves and ours (two nights) including a day exploring the Cheow Larn lake. For us, day one gave us the biggest highlight - the much-anticipated elephant experience – and it didn’t disappoint. The elephant sanctuary is not located right by the lodge, but is a short five minute drive away – and here the Elephants roam with their mahouts close by. All of the elephants became domesticated through the logging trade and once this industry was banned the elephants were rescued by Elephant Hills to be looked after in a sustainable way. Since the logging industry had destroyed the vast majority of forest, the survival of these fabulous mammals was at risk, thus introducing the elephants to tourism enables them to be well cared for, and of course allows people like us to interact with and learn so much more about them. This means that we were lucky enough to be able to watch these magnificent creatures going through their day’s work of feeding, bathing and playing, which was an incredible experience. I feel at this stage I should highlight that at no time are these animals restrained with chains, and people aren't allowed to ride them. Those that do either of these should be avoided at all costs. I am not sure if it is possible to explain the excitement of a three year old in encountering an elephant in this way. Having not yet visited a full zoo I cannot think of a better way for her to have learned about these creatures. 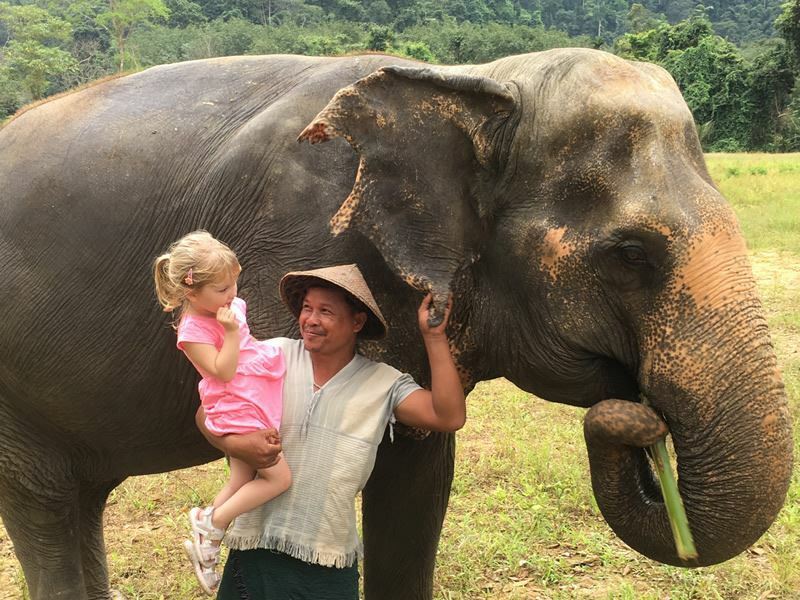 The first meeting was one of some trepidation, but being a reasonably cute young girl it wasn't long before the mahout took her in his arms and introduced her to her new friends up close, tickling its ears and stroking its head. With one quick flap of the ears Abi switched from nervous giggles to full on wonder as this awesome beast playfully reached out for a tickle with his trunk. After the first magical encounter we progressed to their bathing zone and were joined by several elephants ready for their morning mud bath. Watching them wallow around and spray each other with mud was just fabulous. After the mud bath came the shower, and this was a real highlight. I was certainly nervous being invited to wash and scrub these magnificent beasts, and I was almost pulled in by the elephants trunk eager for the next stage to get going. 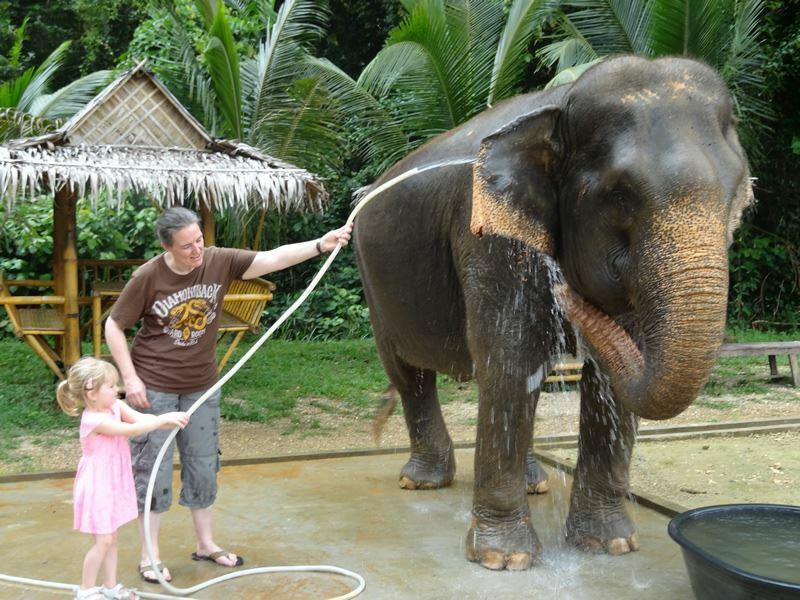 However, knowing no fear at this stage (bar getting wet which no young girl really likes when fully clothed), Abi moved in and was soon washing and scrubbing the elephants with glee. Using a coconut husk to give them a good rub down the elephants really did seem to enjoy this experience, almost directing us with their trunk where to scrub and which itch to scratch. It wasn’t long before we were both spraying water all over the place – hopefully getting a decent amount on the elephant. As I stood there, daughter sitting on one arm, hose jointly held in the other, the elephant again sought us out with her trunk. With a little translation from the mahout it seemed the elephant wanted us to fill up her trunk ... quite literally – so into her trunk we poured what felt like gallons of water, which the elephant then joyfully sprayed onto her back and belly before quickly coming back for more. It really was such great fun, we could have carried on all day. From there it was time for elephant snack time – and my word do they get through some food. The average elephant eats about 200kg of food every day, so armed with a rather intimidating cleaver we each prepared a huge bucketful of fruit and fibre – pineapples, bananas, sugar cane and a little vitamin pack with fruit and various bits and bobs wrapped up in grass. I think the idea was for each of us to feed their bucket to a different elephant, but of course Abi wanted to share it out. So, after the first nervous encounter with a very eager food seeking trunk she was very excitedly running between three or four elephants – one food item at a time. It was great fun, though I think we maybe stayed a little longer than we should before heading back to camp. I would quite happily have felt my experience was done at that stage, but of course we had three days of activities planned, so after lunch we ventured for the river. Donning safety vests we travelled two (or two and a half) by two in river rafts and are paddled smoothly down the river. What seemed like a chilled river ride without much to look at quickly became a masterclass in wildlife spotting, with amazing tree frogs, lizards, iguanas and even snakes watching us from the tree branches as we traversed through the water. A very relaxing few km later we went back to the camp for our first overnight of glamping. Having got to know our group well (there tends to be eight or so on each itinerary who are following the same programme) the evening was very social, starting with a short film about the elephants and their history in Thailand. Each night the video is different, so those on the longer four day stays don’t have any repeats, and we all found it very informative. Even Abi seemed enthralled with it. The video was then followed by a lovely Thai dancing display by a group of local children from one of three local community schools sponsored by Elephant Hills, before a fantastic Thai Cooking demonstration. Appetites whetted it was then time for dinner, and after an amazing day there were very few staying up for any late drinks. With the emphasis very much on the glam part of glamping we had a fabulous night’s sleep, and after waking to the jungle sounds and enjoying a hearty breakfast we were off to the lake. This is where misfortune struck us in weather terms and we experienced the delight of a full 48 hour rainstorm. Whilst we had an enjoyable day it obviously wasn’t the ideal conditions for a boat trip, but on a drier day it would have been superb. 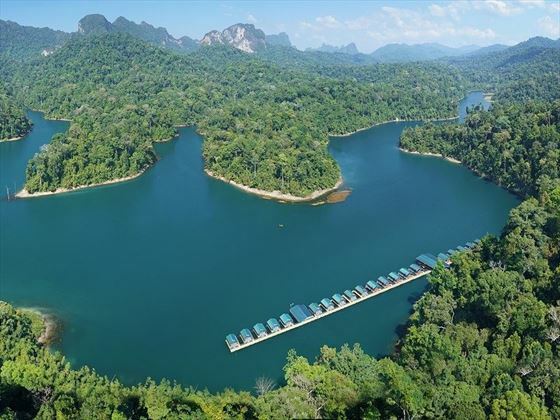 The focus of the trip was to reach the second part of the Elephant Hills camp – The Rainforest Camp located in the heart of Khao Sok National Park on Cheow Larn Lake, an immense artificial lake created through the construction of a hydroelectric dam, saving the locals from constant flooding from the Klong Saeng River and providing the region with a much needed electricity supply. Despite the weather we could see the lake was stunning – the journey to the lake took us via the dam to see just how immense and beautiful the lake was, and visibility aside it was easy to appreciate this. Travelling by longtail boat we arrived somewhat damp at the Rainforest Camp, just in time for a break in the weather (Top tip – if raining and travelling by long tail boat, bag yourself a seat at the back of the boat and in the middle…there is only so much protection a waterproof jacket will give you). The lake based camp is excellent, and if we did not have our daughter with us we would most certainly have stayed here for a night. There was utter peace and tranquility - with no phone signal, no wifi and electricity powered by solar and wind energy it’s a place to really relax, take a swim, explore the lake by kayak or enjoy a guided trek. Even for our short stay we could see how fabulous it would be to spend time here – so definitely a reason to go back. Day three was planned to be our jungle hike, but for us with a young child and another older couple, the hike after the level of continuing rain we had experienced was not advised, so sadly we missed that activity. Nevertheless that simply meant we could head to the beach a little earlier than planned, where happily it wasn’t raining. It may only have been two nights but our stay at Elephant Hills was simply fantastic – and I mean simply in the truest way – nothing flash, very straightforward and casual, and reassuringly focused on the environment and preservation of the elephant population as well as their local community. By this time we had hooked back up with our friends from Bangkok who had come to meet us at Elephant Hills, so we all travelled together back to the beach for some well deserved R&R in Khao Lak. We had held our room over for the short stay in the jungle so were straight into beach mode and chilling by the pool straight after lunch. The rest of the stay was the usual combination of pool, beach, food and sleep that we all long for. All I then wanted was more time – another week, more beach walks, more messages, more lazy days and I might have been ready for the journey home, which came upon us all too quickly.